Sun, sand and… wine, of course! The perfect vacation includes all three elements. 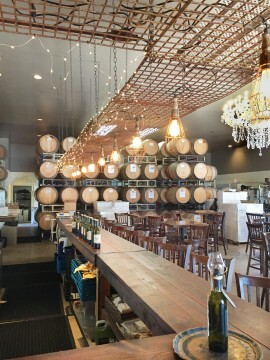 A recent trip to Carlsbad, California, brought everything together, including the happy surprise of a downtown winery/tasting room. 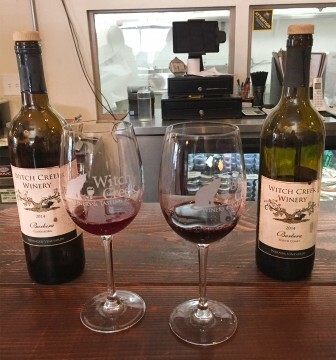 Our visit to the Witch Creek Winery was exceptional! Some dear friends invited us to join them on a vacation in Carlsbad and even gifted us our own condo unit! We tried to express our appreciation by providing some fun wine tasting experiences out on the sunny commons. Before long, though, our wine inventory fell to an alarming level. It was time to restock! 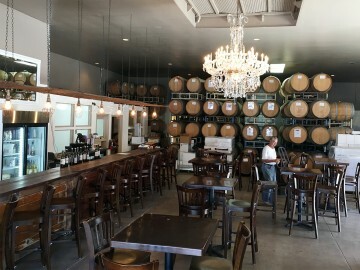 Luckily, our friends new of a winery within walking distance (yes!) of our condos, so we set off for Witch Creek Winery. As we entered the winery, we immediately noticed the split personality of the space. Half of the large, well-decorated area was dedicated to wine, but the other half was dedicated to coffee. Yes, finally! A space that addresses both the morning AND the afternoon/evening needs. Something of a “business on the right, party on the left” approach. A sideways mullet? We made our way to the wine tasting bar and met Lani, our wine guide for the day. She told us that the coffee roasting started in the wee hours of the morning so that all of those yummy coffee smells (that could ruin a wine tasting) were out of the building before any winery customers arrived. Lani got us started with a fun white wine with the fanciful name of Eye of Newt Rosé. We enjoyed the aromas of watermelon and citrus and the crisp apple and cherry notes on the palate. Pleasantly dry, with nice balance, we put 3 bottles on our “take to the condo” list. Off to a great start! Next up was their Cool Cat Sparkling, a Chardonnay and French Colombard blend. The French Colombard added some amazing complexity and nuance. A wonderfully dry sparkling with hints of orange zest, several bottles joined our purchase list. Lani next poured a side-by-side comparison of their 2014 Barbera from Clarksburg and their 2014 South Coast Barbera from the Fullbrook area. We liked them both (and actually purchased both) but enjoyed the differences between these two vineyards. Although both made by winemaker Ryan Scott, the differences were striking, even visible! The Clarksburg Barbera had leather aromas and a soft, fruity flavor, with Bing cherry leading the way. The South Coast Barbera was a more traditional, punchy and tannic rendition, with a hint of cinnamon on the finish. Perfect beside a steak. We then tasted their 2014 Sangiovese. Lovely library aromas, with a hint of blackberry, and great depth of fruit on the tongue, especially red plums and cherries. The finish vanished like a ghost, leaving the tiniest hint of tannins and spice. The 2014 Tempranillo had equally good complexity and a welcoming aroma that made us look forward to our first sip. We next ventured into some blends. 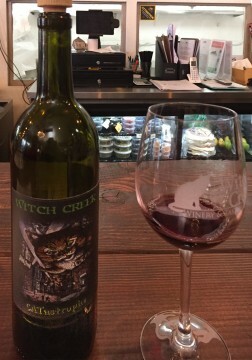 Their first blend was called CATastrophe (see what they did there?). This was described as their “secret blend” because the winemaker did not disclose the component varietals. We found it mellow and smooth, with middling tannins and a nice level of acid on the finish. We were stumped, though, trying to identify the blending wines. Their 2013 Tres Amici was documented, containing Nebbiolo, Barbera and Petite Sirah. Ryan Scott showed his talent for balance here, by delivering a superbly drinkable wine. Yes, some came home (um, to the condo) with us. 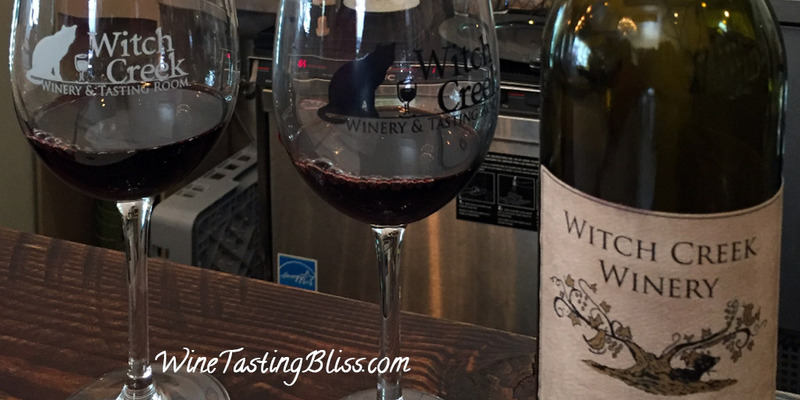 The blends continued with their Dos Amigos, combining 60% Tempranillo and 40% Petite Sirah. I called it “a bunch of fruit cheering” and put a bottle on our “bring home” pile. Their 2014 Zinfandel was next. Aromas of a forest after a rain and flavors of fruit and spice throughout the taste. Lots of alcohol, too. At 16% it compares with Lodi Zins for punch. The tasting was coming to a close. Whew, so many wines! Luckily we had shared tastes and divided the wine list among the five of us. The penultimate taste was their 2014 Tannat. A gorgeous blueberry aroma, fruity with a crisp finish with tiny tannins. You’re right, one of these came back with us, too. We finished up with their Moscato dessert wine, which exceeded expectations! Vanilla and apple sauce up front, with a pear and lime surprise that forced us to take some back to sip on while we watched the sunset. 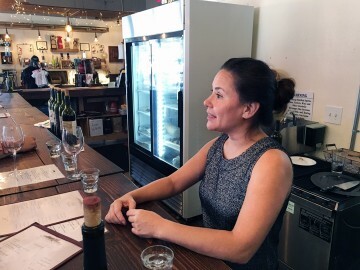 With our wine inventory replenished (we purchased more than a case, it turned out) we thanked Lani for a truly extraordinary tasting experience and set off into the Carlsbad sunshine. Yet another reason to return soon! 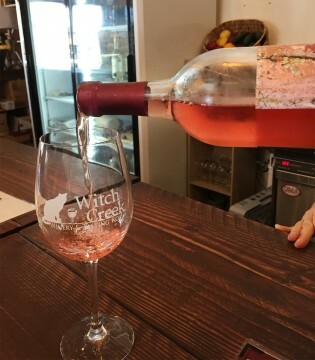 Have you visited Witch Creek? Click to give'em a tweet of support! Next Post:Running Out of Wine?